So looking back a few posts I have apparently gotten lazy with posting pics. That would actually require loading them onto the computer. Yeah, need to do that. So for one more time, just words on this one. I promise I'll make up for it soon. We've been housebound a lot the last two weeks. It makes for a messy house and a caged in mommy, but otherwise it hasn't been too bad. Shane's been gone all week and it driving home as we speak, or write I guess I should say. And then it's lunch and lego club for the kids this afternoon. Woohoo! What a treat to end the week with no hubby and yucky weather. Ellie will be 1 in just a couple of weeks. We're trying to plan a party with her BFF Khloe so that should turn out really really cute. I just am in denial that I am going to have a one year old and not an infant anymore. Seriously did time go that fast? How on earth did I get to have a third kid who is going to be one? 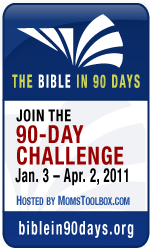 I am plugging along with the bible in 90 days challenge. I did get behind one day over the weekend but thankfully caught right back up. It's amazing how much I am craving to read the bible that much. It takes almost 45 min for me to get through the twelve pages a day and especially through Leviticus. I forgot how grotesque and detailed the sacrifices were. Definitely took away my appetite! It made me to thankful for Jesus and that I don't have to constantly go collect birds and goats to kill. I pretty would be doing that all the time. And I seriously want some manna. I wish God put his recipe in there so I could try it. Hopefully we'll get it in heaven. I'm a huge bread lover and can't imagine how awesome that tasted. Shane got me a Nook color for Christmas and I was able to download the bible on there and it is awesome. It's so lightweight and I can take it in my purse or carry it throughout the house. Technology can be great! I have heard some good things about the Nook...good for you! !